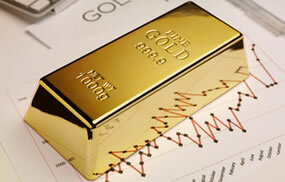 Precious metals futures rallied Monday in starting the new trading week and month. Gold closed around a 20-week high and palladium scored a fresh record. Gold for February delivery tacked on $13.60, or 1.1%, to settle at $1,239.60 an ounce on the Comex division of the New York Mercantile Exchange. The settlement was the highest since gold ended at $1,239.70 an ounce on July 16. "We remain committed to the idea that both gold and silver are physical commodity markets in need of a lifting of global economic headwinds from trade issues, and the news over the weekend certainly moves the needle in that direction," MarketWatch quoted analysts at Zaner Precious Metals..
U.S. and China agreed this weekend to a put the trade war on hold. Gold futures ranged from a low of $1,226.60 to a high of $1,240.40. On Friday, they closed 0.2% higher on the week for a November increase of 0.9%. Silver for March delivery surged 28.2 cents, or 2%, to settle at $14.499 an ounce. The finish was the highest since prices ended at $14.502 an ounce on Nov. 21. Silver futures traded between $14.28 and $14.65. On Friday, they ended 0.2% lower on the week for a November decline of 0.5%. January platinum added $10.90, or 1.4%, to $810.70 an ounce, ranging from $801.40 to $816.50. Palladium for March delivery advanced $21, or 1.8%, to $1,165.60 an ounce — a new record. Palladium traded between $1,149 and $1,178.70. The pair divided last month with platinum tumbling 5.1% and palladium jumping 7.1%. Gold rose $12.75, or 1.1%, to 1,230.30 an ounce. Silver added 15 cents, or 1.1%, to $14.385 an ounce. Last month in LBMA prices, gold rose 0.2% and palladium jumped 11.4% while silver declined 0.7% and platinum lost 3.5%. United States Mint bullion sales rose by 150,000 ounces in American Silver Eagles. Below is a sales breakdown of U.S. Mint bullion products with columns listing the number of coins sold during varying periods.